Overexertion costs businesses $12.75 billion in direct annual expenses . Understanding EHS Best Practices is a vital part of allowing companies to mitigate against injuries, avoid a position of negligence, and limit costs of worker’s compensation, litigation, and lost productivity.. SpitzLift’s vocational Train-the-Trainer safety program facilitates the understanding and utilization of proper setup and material handling techniques. 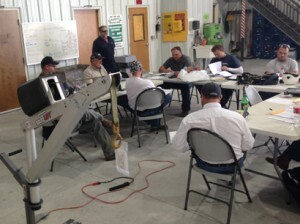 SpitzLift offers both classroom and field training. Our experiences have shown the importance of not only classroom training, but also hands-on field training that ensures a relatable, comprehensive understanding. SpitzLift’s Train-the-Trainer program includes in-depth safety and maintenance instructions and a training manual customized for your SpitzLift equipment. Our training program ensures companies do not waste money, time, or resources. We look forward to partnering with you to provide safer work environments. To read more about workplace injuries, click the link below.